Leonardo Sciascia's dedication to Racalmuto. 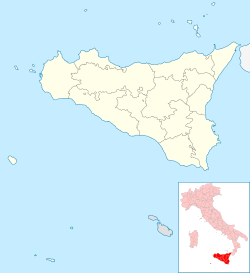 Racalmuto (Sicilian: Racalmutu, from the Arabic "rahal-maut", "village in ruins") is a comune (municipality) in the Province of Agrigento in the Italian Autonomous Region of Sicily, located about 90 kilometres (56 mi) southeast of Palermo and about 15 kilometres (9 mi) northeast of Agrigento. Racalmuto is the setting of Angelo F. Coniglio's historical fiction novella The Lady of the Wheel. Racalmuto borders the following municipalities: Bompensiere, Canicattì, Castrofilippo, Favara, Grotte, Milena, Montedoro. ^ "Hamilton Ontario Sister Cities". Archived from the original on 2007-09-26. Retrieved 2008-01-24.